Lenovo A7-30 Tablet (WiFi+3G+16GB) is currently not available in any stores. Lenovo is hitting the tablet segment again with the new Lenovo A7-30 Tablet with wifi, voice calling and 3G sim support. 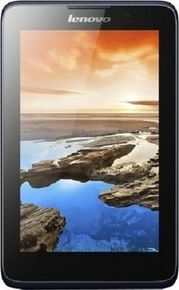 Lenovo A7-30 A3300 Tablet lowest price in India 13000 on the e-commerce website maniac store. Following are the detailed Lenovo A7-30 Tablet reviews and specifications. Lenovo A7-30 Tablet is an orthodox lineage of basic designs in the segment and has a net weight of 327 grams, which makes it a medium weight category tablet. The device has a matte finish rear panel which is scratch resistant and gloss free. Lenovo A-30 specifications highlight a MediaTek quad-core processor with a clock speed of 1.3 Ghz and 1GB ram. It has an inbuilt memory of 16 GB which can be expanded upto 32 GB by a micro sd card. Lenovo A7-30 Tablet battery is a non-removable 3500 mAh Li-ion setup which enables a fair enough battery standby. Lenovo A7-30 Tablet is a bit outdated in terms of its O.S. It runs on the Android v4.2.2 JellyBean platform, which is a swift way to cruise along on the go. This device seems to be a real benchmark by Lenovo in its segment. The phone includes Bluetooth v3.0, wifi, and has 3G sim support. Lenovo A7-30 Tablet, which sports a 2 MP primary camera with geo-tagging, can be purchased online at various e-commerce sites. Daylight pictures are fine. The camera resolution is 1600x1200 pixels. The 2 MP camera is capable of video recording. The VGA front camera is like the VGA in every other rival of Lenovo A-30 tablet. The 7 inch display has a resolution of 1024x600 pixels and a capacitive touchscreen. To summarize the Lenovo A7-30 Tablet specifications and details, Lenovo A7-30 Tablet is an average device for low budget tablet enthusiasts. Dell Venue and HP 7 Slate are other options worth checking out before you buy any of them. Lenovo A7-30 Tablet price in India is 13000 approximately. For detailed online price comparison, you can hit the e-commerce market.